Mimaki Engineering Co., Ltd. (Mimaki), a global industry leader and manufacturer of wide format inkjet printers and cutting plotters, announced today that it will launch the MM700-1800B, a high-speed 1.8 m wide roll-to-roll direct-to-textile inkjet printer, in May 2016. As tastes and preferences in the textile and apparel markets are becoming more diverse in recent years, there is a continuing shift from away from the traditional analog printing methods of mass production, in favor of digital printing that allows on-demand production with a wide range of personalization and adaptability to individual needs. Accelerating this trend even further is the arrival of “extreme on-demand production,” in which orders are accepted via the internet for mass production of freely customizable “one-of-a-kind in the world” items. Mimaki predicts that consumers will begin to regularly create custom designs once they have grown weary of ordinary design options in the marketplace. To accommodate such ultimate order-made printing, we will offer solutions to realize diverse printing with digital on-demand printing. The soon-to-be-released MM700-1800B uses various sensors and cameras during printing to automatically detect the textile feed advancement distance, seams, media jams due to head striking, meandering, and more as it controls the transport of the textile. The printer itself makes adjustments to prevent trouble before it occurs, allowing stable printing to continue without constant operator supervision. Its carriage is driven by a linear motor that gives it positional accuracy on the micron level, which combines with a “variable dot” system delivering ink in multiple drop sizes to produce beautiful prints with even higher accuracy. In addition, its 16 printheads arranged in 4 staggered lines achieve a best-in-class print speed of 800 m2/h*1. The MM700-1800B is an inkjet printer that produces superb image quality at impressive speed as a natural result of its development focused on high stability. 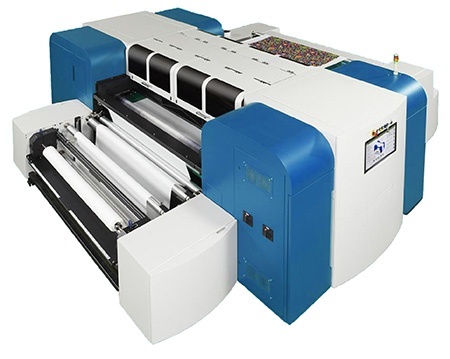 - Adhesive belt transportation mechanism ensures stable printing on a wide range of textiles. In addition, a roller bar is installed to the feeding side of the belt and it presses the textile against the belt to enhance adhesion. - The MM700-1800B doesn’t require constant manned operation thanks to its various control and monitoring systems. Tension control, wrinkle detection, seam detection, jam sensing, and automatic meandering correction are provided. Furthermore, pass boundaries are monitored by a camera, and feed advancement distance is constantly optimized. - The printhead carriage is driven by a linear motor, and its micron-level position accuracy delivers beautiful print results. - Variable dot printing reproduces details of designs with subtle colors. - The MM700-1800B delivers peed that’s among the best in the industry. Sixteen printheads are arranged in four staggered lines, helping it achieve printing speeds of 800 m2/h*2 in draft mode and 560 m2/h*3 in standard mode. *4: One ink type can be selected at the time of purchase to be loaded to the printer; please note that the ink type cannot be changed once it is loaded. Tension Control optimizes the tension to the textile. In order to enable efficient roll replacement, the Seam Joint Sensor detects seam joints and roll ends and stops the printer. The Jam Sensor and the Wrinkle Sensor detect small amounts of deflection or wrinkles in the textile to prevent a head strike or jamming. Moreover, when the textile path is meandered, it is automatically corrected. Pass boundaries are monitored by a camera, and feed advancement distance is constantly optimized. For direct-to-textile printing, it is crucial that textile transportation remains stable even when various types of textiles are used. Tension applied to the textile varies during a print operation due to several factors including feed/take-up roll outer diameter changes, ink usage amounts, and textile weave patterns. A high-speed printer is unable to demonstrate its performance to the fullest without dependable textile transportation. The MM700-1800B ensures optimal performance with an adhesive belt transportation system with a roller bar for enhancing adhesion and reducing wrinkles/sags of textiles. The printhead carriage is driven by a linear motor to provide micron-level position accuracy. Variable dot printing produces smooth and subtle gradations and expresses every exquisite detail. The MM700-1800B delivers speed that’s among the best in the industry. Sixteen printheads are arranged in four staggered lines, and achieve printing speeds of 800 m2/h*5 in draft mode and 560 m2/h*6 in standard mode. Four ink types will be provided to suit a wide range of applications*7. The large-capacity 20 kg ink packs support high-speed printing. *7: One ink type can be selected at the time of purchase to be loaded to the printer; please note that the ink type cannot be changed once it is loaded. Note: For product improvement purpose, data in the above specifications are subject to change without notice. *8: These ink types will be available in the future.